The T-2 Buckeye was produced by North American Aviation as a jet trainer aircraft for the U.S. Navy. The trainer established an outstanding record of safety and reliability and provided a wide variety of training for more than 11,000 students, including high-altitude, high-speed formation and aerobatic flights, basic and radio instruments, night and day navigation and gunnery, bombing and carrier operations. 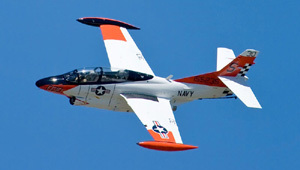 The Buckeye was the primary jet trainer for the U.S. Navy until it was replaced by the T-45 Goshawk in 2008. Two other countries currently operate the T-2, the Hellenic Air Force in Greece with approximately 35 T-2E models and the Venezuelan Air Force with several T-2D models. Both use the aircraft for training and light attack. Maney Aircraft, Inc. will provide full support for this aircraft as long as it is in operation. In addition to spare parts, Maney Aircraft, Inc. can supply component overhaul & repair, upgrades (airframe and avionics), rewiring, and training.